RapidNylon® parts have proven to be a great application for a functional rapid prototype for automotive, aerospace, etc. More recently, however, the exclusive parts made by Synergeeing Group have been a great tool for more “out of the box” applications. 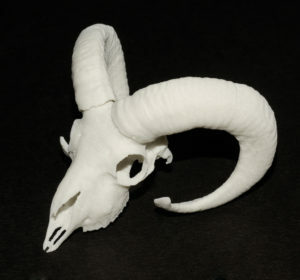 From-Nature-To-Art.com has developed a way to take a CT scan of an animal and convert it into a working CAD model to be produced with additive manufacturing technology, (a form of 3D printing). Synergeering Group has recently begun working with From-Nature-To-Art.com to produce these unique models as a RapidNylon™ piece. The modified laser sintering technology behind a RapidNylon™ part makes it possible for these very complex geometries to be easily produced and doing so without compromising the high level of detail in the CT scan. Also, the glass-filled nylon (plastic) material that is used to produce these has a natural matte white finish and makes these look like real bone! From-Nature-To-Art.com is currently featured on Kickstarter, and their models can be purchased on their website. Check out the links below!